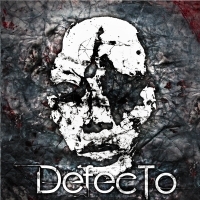 From Copenhagen in the cold North, four young musicians in their early 20s decided to merge two bands “Sonne” and “Deviant”, both of different music styles, and ended up with Defecto in 2010. Front man Nicklas Sonne (guitars & vocals), with his symphonic & metal riffing musical influences, joined forces with the alternate prog rock group Deviant, which included Frederik Møller (guitars, backing vocals), Henrik Been (drums, studio keys) and Thomas Bartholin (bass guitar, backing vocals). The act decided last year to release this promo EP. With help from producers Jan Langhoff (Aqua) and Flemming Rasmussen (Metallica) an EP album of 6 tracks, with an easy accessible modern progressive rock/metal sound, was recorded. One of the highlights from the promo is the opening track “Excluded”. It has a great heavy groovy feeling to it, and the vocal really shines on this track. Sonne has a rough, but still very controlled vocal that goes from mid to high range, and his growling singing style adds something unique to the chorus. Another highlight is the amazing track “When Daylight Dies”. It has an aggressive progressive touch, and starts out with some wonderful heavy tunes. Fredrik and Sonne are throwing in some nicely performed guitar solo/shredding during the track, which shows us the outstanding musicianship of this band. Singer Sonne also gives us his best vocal performance on this EP with a very dynamic and clearly recognizable vocal. The technical skills of this band is not to be underestimated, even though the only musical barrier is a heavier sound missing in the overall production, that can provide some punch to the musical landscape. This is a well written EP release from a new Danish prog metal group with huge potential. They are pretty good at mixing up symphonic elements, with heavy riffing and melodic tunes spiced up with progressive layers. A full release is expected during 2012-2013 and if they continue on the same musical path and add the missing ingredient, this will be worth the wait.